I attended the Prizes Summit today at the London Business School, organised by Innovation Prize specialists OmniCompete, which sought to investigate and debate the increasing role of prizes in supporting and stimulating innovation. There have been some big success stories in recent years, most famously the X-Prize Foundation, and a little closer to home NESTA’s Big Green Challenge. Whilst these almost certainly have great value in solving wicked problems, I still question what role that prizes play above and beyond the very important PR value of having a big prize generates. And I’d love to see some work on the price elasticity of prizes as I am deeply sceptical that a £2m prize is twice as effective as a £1m prize. Ultimately I believe a prize should only be used as an important last resort – namely if there is a a well expressed and difficult problem for which you’ve explored all the existing obvious solutions and are now looking for unexpected or surprising solutions. If the solutions aren’t surprising then you haven’t done your homework right beforehand. In many ways it depends on how you define a prize. For me a prize needs to be the start of something, not the end of something, and so I was pleased to hear the distinction today on a focus being on, what are called ‘inducement prizes’ rather than ‘recognition prizes’. One speaker said he preferred Contracts rather than Prizes, and we often find that small, flexible contracts can work really well rather than monolithic prizes. I gave a short presentation about open innovation in the afternoon and my slides are available to view below. 1. Financial incentives can have perverse outcomes – Dan Pink summarised a lot of research in his excellent book Drive, where he showed how “For complex and creative tasks, financial incentives has a negative impact on performance.” In particular, your top 1%* are not primarily motivated by money. That isn’t to say money isn’t important but the primary incentive is always some kind of unmet need or an interesting challenge that is intriguing in it’s own right. 2. Clients not Cash – Jason Pinto from Amadeus Capital made a good point that that clients are better than any investor, which I whole heartedly agree with. We have a mantra, namely Start at the End. In other words be really clear about the business relationships you are looking for before you start any competition process. The worst thing you can do for your reputation and for the success of such a process is to shift the goalposts part way through (which large organisations are optimised to do). 3. Brilliant questions are more important than prizes – Not all the smart people work for you said Bill Joy, so prizes and incentives are one way of attracting the smart people who don’t work for you yet. However, you only get 1 chance to do this well and that means sharing both risk and reward, and it strikes me that the way most Innovation Prizes are structure at present don’t quite address that yet. And the best way to interest others in your challenge or problem is through asking a question that is intriguing in it’s own right, above and beyond the Prize. And to be fair this is something that both the Ansari X-Prize and NESTA Big Green Challenge did very well. Anyway, all in all it was an interesting event and I learned a lot and the one thing that everybody seemed to agree on, is that prize based innovation is on the increase so we all need to get smarter and learning when and how to use it well. *Your top 1% are lead users or extreme users that exist in any community – defined as people aware of an unmet need and intrinsically motivated to do something about it – check out the work of Erik Von Hippel or Jakob Nielson for more on this. I found Peter Diamandis’ presentation on prizes interesting. His main case in support of them was that they can get people to focus on, and invest considerable amounts of time and money in, what he calls “audacious (and achievable) goals”. You could question how much we need a space tourism industry, and when does audacious become just showing off for the sake of it – but there are surely audacious socially useful goals where it’s worth trying almost anything to catalyse further investment. One of the questions the Summit tackled was how to use, and justify the use of, public funds for prizes. I’d hope that a social innovation prize would stimulate solutions that were not only surprises but also enterprises. The delivery of that solution needs to be sustainable, rather than reliant on further grants in order to scale up. Thanks for a good blog (as ever) Roland, and thanks for the kind words about Big Green Challenge. I feel pretty optimistic about the role prizes could play, particularly in public and social innovation where they are less tested. If we can be smart about the way we design prizes then they can have great impact above and beyond the PR value – eg. by finding, giving exposure and validation, and leveraging resources for new or previously unknown innovators; also by accelerating and galvanising responses to a particular challenge. I do have a concern though that the growing interest in prizes will result in a proliferation of prizes that are either mainly recognition prizes (I do think these have a place; I just think the real untapped potential is more in inducement and other types of prizes), prizes that stop with the generation of ideas, or not really prizes at all. This could easily result in ‘prize fatigue’ and we will have missed the opportunity to use prizes effectively. I was encouraged by David Willetts saying that, in looking at the role prizes can play, BIS are keen to look at prize models that go beyond ideas. I would also be interested in seeing prizes tested in national and local government (perhaps staged inducement prizes, similar to our social challenge prize model) being adapted to feed new suppliers into procurement processes. Francesca, you make a very good point. That is one of the reasons why I’d advocate building sustainability into the prize criteria and also offering support to participants in the prize – during the prize process itself and/or as part of follow up activities. During the Big Green Challenge we offered more support at each stage, so that as we demanded more of competitors we also offered more support. All of the Finalist projects, and many that reached the intermediate stage are continuing. 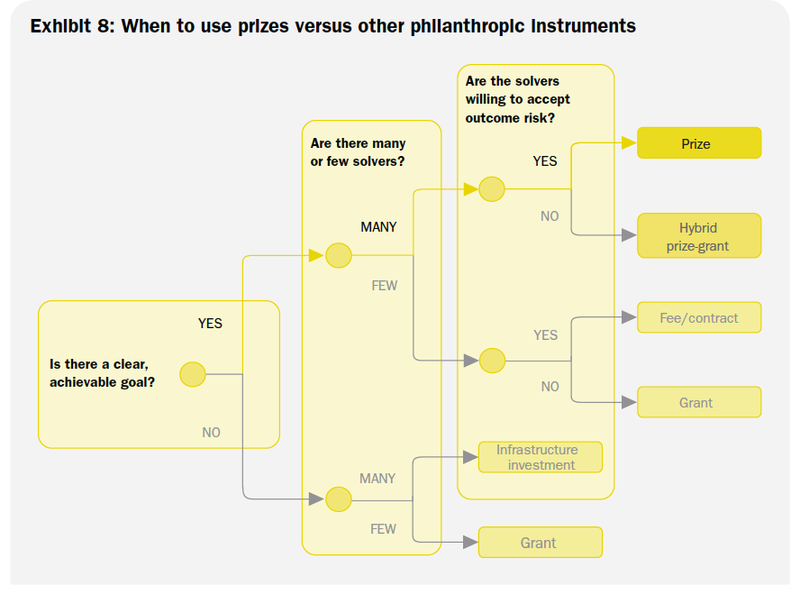 Some are still reliant on grants to some extent, but the prize process, and for the winners their financial prizes, offered them some space to think about a more sustainable strategy. Hi – thanks for your comments which could all be blog posts in themselves. David – fully agree. We need more audacious goals and prizes are one way to draw attention to tackling them. Francesca – agree sustainability is important (but of course difficult) and enterprises are more important that surprises (I got a bit carried away with creating a snappy title). Therefore if there are investors, or better a client, waiting in the wings (like the GE Ecoimagination competition recently) then that can help to accelerate adoption of winning solutions. Hi Vicki – thanks for the comment (which is definitely a blog post in it’s own right!) and you are the expert here no doubt. Glad to hear you are optimistic and I think the fact that so many of the Big Green Challenge finalists may not have applied or become aware is a really important point too. And don’t get me wrong, PR is not a bad thing – we ought to be casting the net as wide as we can in these circumstances and capturing peoples imagination is so important, but it can’t be the only attraction. Unfortunately I missed David Willetts speech but agree there could be more and better use of prizes to solve intractable problems in our society. I do really like the support and development provided in addition to the prize money as this is where a lot of value is created, even though it’s costly. Great lessons here for both participants and prize managers. How true! To be honest, this relates not only to prizes but to any type of funding for innovation. I was once studying for a PhD in a project funded by a major company. A PhD *should* be where research does innovation, but many times this turns out not to be the case. I’ve seen, in the years, proposals written to match the expectations of the funding/awarding body. Without any real or important deliverable. I believe that prizes are a good idea. However, they should aim at cutting out participants that have this kind of behaviour. They should also discourage proposals “targeted for the funding body”. These proposals do not innovate: they just exploit resources. The problem is that most of the times the prize money are there for grabbing and there is no way of stopping the awarding process. What would you think of the possibility of not awarding the prize if a given quality level in the proposal is not reached? This way, you can cut out “unsurprising” results.